For anyone who comes to the junior miners website here often knows very well that I not only write and research about small junior companies, but I also placer gold mine in British Columbia myself. So whenever I come across a junior mining company that is in the process of starting a placer mining operation my antenna's go up. After all it's something I know and understand and am always interested in. But what's really interesting with Blue River Resources is not only "where" they are working, but "how" they are incorporating a different technolgy to finding gold. (We'll get to that in a moment). But first a bit of information for those who are not familiar with placer mining. Placer mining is the type of mining that is done by sluicing or washing gold bearing material. Unlike hard rock mining where drilling and blasting and crushing is done, placer mining is a fairly simple system and in fact the principles of the extracting gold have not really changed in the past few thousand years. Whenever you see someone panning for gold, that's a simple form of placer mining. No chemicals are used in the process, just water and in a most cases today the water being used is recycled over and over with only minor amounts of fresh water added. So back to Blue River and the "where". 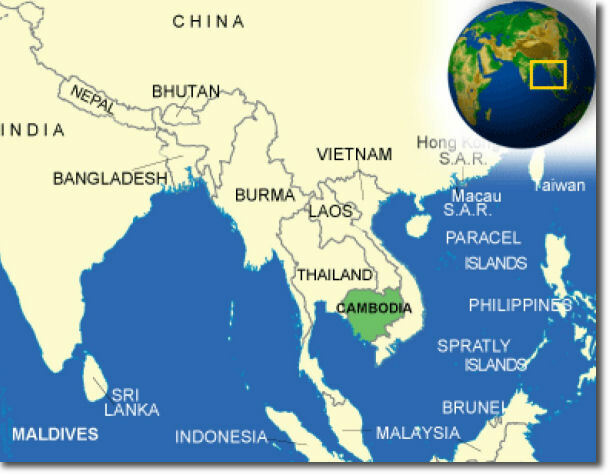 Well the country they are working in to develope this placer operation is Cambodia. When I first heard Cambodia I was very much surprised because it's one of those places we or at least me never thinks about but after reading over some of the information on this project all I could say was WOW. Blue River's project is the Okalla West Gold project and is located in the Banlung exploration tenement which is located 450 km north-east of the national capital city of Phnom Penh in the Province of Ratanakiri. This tenement is owned by Angkor Gold and Blue River initially has the right to earn in up to a 50% interest from Angkor Gold Corp. after the completion of a total investment of US$3.5 million in exploration expenditures over a 4-year period. After that time Blue River can then exercise their option for an additional 20% interest. The entire tenement covers an area of 150 square kilometers but the area that Blue River is focusing it's work on is an area of about 4.5 square kiometers where visible gold grains were found in 83% of the samples. Exploration in October 2015 discovered a 2 square kilometer surface gold anomaly that has recently been expanded to a 4 square kilometer mineralized zone from work conducted in April 2016. Work to date indicates the potential for a significant gold deposit of 400,000 to 800,000 ounces grading 1.5 gr/tonne. The real bonus here for this project is that with this alluvial ground the depths here are only about 6 meters to bedrock which would mean a very minimal strip ratio. In cases where you find gold at surface you could very well process all the material from surface on down to bedrock. As of today, August 26, 2016 the company issued a news release stating that a shallow drilling program has commenced on the Okalla West. 250 shallow drill holes have been completed to date, of a total of 1200 holes to be drilled. The drill samples will be submitted to ALSs and results will be reported when received. So how was this alluvial deposit actually found? A quick review of what was said earlier was that this deposit is already quite profitable to be mined. Gold average of 1.5 grams per tonne. There had been some French and Russian geology reports and maps from the 1970's to 1990's and there was even an old French exploration journal from 1894 that mentions mafic gabbro rocks south-west of Banlung as being "auriferous", without mentioning any specific location. Then during 2015-2015 there was project for some sampling and mapping and even some termite mound survey (TMS) geochemistry. The geochemistry survey of 12,550 termite mound sites (25,100 samples), led to the discovery of anomalous gold in 26% of the pan-concentrates in this first survey. This percentage increased to 83% of samples containing visible gold in the Okalla West prospect area, located in the central-east of the intrusive complex and the focus of the second phase of termite mound sampling. The gold index anomaly discovery in the first round of termite mound samples, prompted the investigation of a further 4,240 termite mounds in the Okalla West prospect area in late 2015 The infill TMS was done on a 100m x 100m grid spacing with a 25m sample corridor, to better define the first phase pan-concentrate gold anomaly. The discovery of the gold in the pan-concentrates also prompted further research, using heavy mineral separation (HMS) and scanning electron microscope imaging, conducted through a mutually reciprocal work agreement with researchers from the Canadian Museum of Nature, with the aim of identifying the source of the gold. This study showed the presence of both angular and rounded gold grains (up to 1.1mm), from the same sample locations. Leading to a conclusion of the possibility of both proximal (vein) and distal (sedimentary/placer) gold sources overlapping in the Okalla West gold anomaly area. 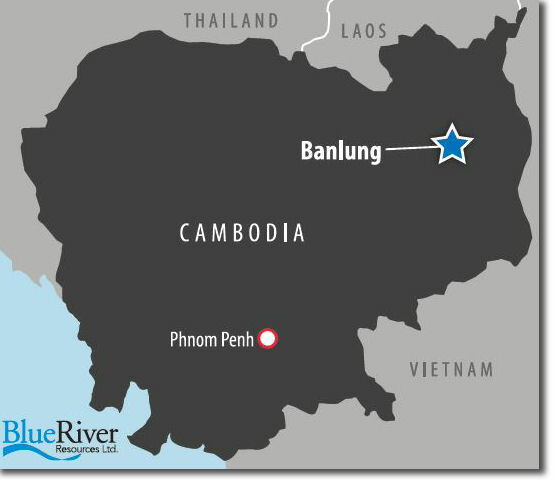 Aside from the company's Cambodia gold play, Blue River is also involved in 2 copper plays. 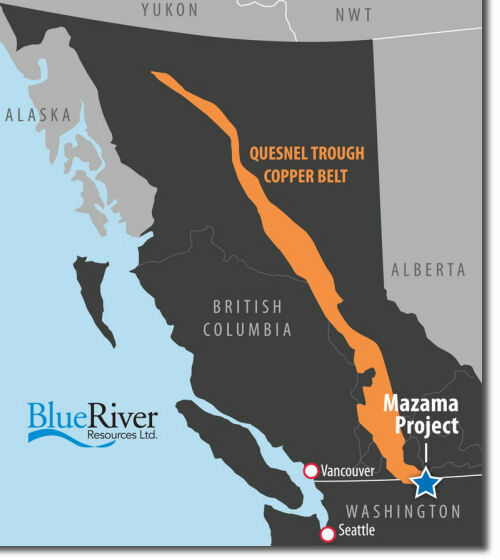 One of those plays, the Mazama Copper Project is Washington state and the other, the Castle Copper Project is in British Columbia. The Castle Project is approximately 25 kilometers north of Copper Mountain Mining, a mid-tier copper producer that commenced production in June 2011. The Castle Copper project mining claims total 8,000 hectares (20,000 acres) and is one of the largest land positions in this highly prospective area. Blue River conducted a 3,500 ft. diamond drill program in 2011, resulting in copper mineralization in eight of the nine holes, with one intersection of 600 ft. grading 0.04% copper and 120 ft. grading 0.16% copper. These results were very encouraging, indicating the potential for a large mineralized system on the Castle Project. Both of these projects lie within the famous Quesnel Trough Copper Belt that runs through central BC into northern Washington. The Quesnel Trough is recognized as one of the largest copper belts in the world, trending for over 2000 kilometers. This copper belt currently hosts 8 producing copper mines and numerous other copper deposits. Today there are thousands of junior mining companies to invest in. With the recent rebound in metals and gold in particular, investor taste for these kinds of investments have turned positive. Prudent and contrairian investors know all too well that these kind of investments run in cycles. Knowing these cycles there is no doubt that the world has seen the bottom of the bear cycle and the time to look at investing in these types of investments is now. Investors who understand this will be active in evaluating companies and projects that have a lot of positives and this is a catagory that Blue River Resources is in. Here is some good reasons to have Blue River Resources on your investing radar.